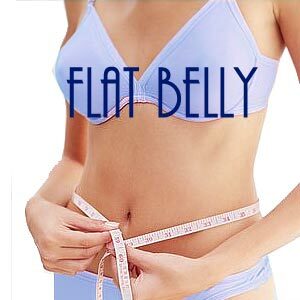 Who does not want to flaunt a flat belly? A sagging stomach or protruding belly is most often the woe of middle-aged women. A flat stomach is one of the indicators of a good figure. Remember that if you are seeking a flat belly, there is no quick fix option. Look up our flat belly tips with flat belly foods to help you sculpt your stomach. These are some of the most effective of ab exercises to keep your belly flat. Lie face down on a mat and place your hands behind your head, lightly supporting it with your fingers. Bring the knees to the chest and lift the shoulder blades off the floor without pulling on the neck. Rotate to the left, bringing the right elbow toward the left knee as you straighten the other leg. Switch sides, bringing the left elbow toward the right knee. Continue alternating sides in a 'cycle pedaling' motion for 1-3 sets of 12-16 repetitions. Use the special chair for this exercise. Stand on the chair and grip the handholds to stabilize your upper body. Press your back against the pad and contract the abs to raise the legs and lift knees toward the chest. Do not arch the back or swing the legs up. Slowly lower back down and repeat for 1-3 sets of 12-16 repetitions. Bring the knees in toward the chest until they are bent to 90 degrees, with feet together or crossed. Contract the abs to curl the hips off the floor, reaching the legs up toward the ceiling. Lower and repeat for 1-3 sets of 12-16 repetitions. Lie face down, with your upper body propped on your forearms and your elbows directly beneath the shoulders. Contract the torso muscles, lifting belly and legs off the floor so that the body forms a straight line from head to heels. Keep abdominal muscles tight so that the belly does not droop. Hold the position for about 15 seconds and gradually increase the seconds each week so that by week four you holding for one minute. Be sure that your stomach is tucked in while doing a push up. This way your abs are working hard throughout the pushups. Regardless of the type of push up, horizontal, elevated or counter elevated, the stomach is still working. You need to increase your body metabolism when you are aiming for a flat belly. Enhanced metabolism results in burning more calories and reducing the accumulation of fat. Eating small meals during the day is recommended. Lean protein diet can help you keep full for a long time and thus check hunger pangs. There are certain foods, which can be termed 'troublesome' and need to be eliminated. The top three foods that cause stomach swelling are lactose, gluten and beans. Lactose is found in milk, cream and other dairy products. Beans are rich in a class of sugars called oligosaccrides that cause significant gas and stomach bloat. Increased water intake keeps you hydrated for long hours; especially during workouts and maintains energy levels. Two hours of aerobics specially aimed at reducing stomach fat - crunches, sit ups, leg raises and lower abdomen exercises can help contain fat that accumulates easily in the abdomen. Food rich in fiber such as wheat bread, beans, green vegetables, fruits and grains enhances your body's ability to burn fat especially from stomach areas. Fiber rich diet also prevents your stomach from bloating and cleanses the bowel system. Stress is a major factor is accumulating abdominal fat. The stress hormone cortisol stimulates the appetite and induces cravings for sugar and fat. And worse still, cortisol signals the body to store fat on the belly. Include rich monounsaturated fats (MUFAs), virgin olive oil, vegetable oils, nuts and seeds and avocados for a healthy diet. Studies conducted by the Prevention Research Center at Yale University School of Medicine in the US revealed that an MUFA rich diet flattens the belly. A group of nine women who followed a four week flat belly diet lost 33 % of their visceral belly and 8.4 pounds in weight and 1.6 inches off their waistline in over four weeks. Drinking plenty of water, eating figs and swapping peanuts for milder pumpkin or sunflower seeds are a few ways to beat the bloat. Eat slowly to avoid swallowing air. Cut out fizzy drinks and be aware of the impact of foods like pulses, dried fruits, broccoli, cauliflower, cabbage, peppers and citrus fruits which are more likely to create wind in the gut. Reduce the intake of salt which makes you retain more fluid. Fried foods digest slowly and can cause bloating. Above all, avoiding erratic eating habits like long gaps between meals, smoking or consuming coffee on empty stomach can worsen your bloat. Fruits have always been considered flat belly food. Fruits are high in carbs and rich in fiber. Oranges and carrots are excellent flat stomach food. Selenium is a wonder mineral that is found in whole grains, nuts, poultry, red meat and seafood. This has been proven to reduce stomach fat as well aid in fighting cancer. Vitamin E boosts the effects of selenium. Almond is considered the king of nuts and is loaded with nutrients and helps reduce blood sugar. It also provides a good amount of antioxidants. Almonds and almond butter can be consumed daily. Salmon is best for those who want to lose belly fat. Salmon is packed with healthy fats such as omega -3 as well as calcium and vitamin D.
Green leafy vegetables like raw broccoli, spinach, brussels, sprouts, and collard greens rank high on the list of flat belly foods. They are loaded with nutrients and pack a good punch of fiber as well. Turkey is another high protein food that is proven to keep post meal insulin levels low due to its leucine content. Macadamia nut oil has large concentration of monounsaturated fats and can be used for cooking. Whey protein isolate shake can be a great source of protein, calcium and branched, chained amino acids. And a combination of calcium and branched, chained amino acids is a great way to burn fat. Berries such as blueberries, strawberries and raspberries are antioxidant powerhouses and help keep belly fat at bay. Research shows that those who eat strawberries have better regulated blood sugar levels than those who do not. Belly fat is not just ugly but also unhealthy. It can raise the risk of heart diseases, diabetes and even lead to some cancers. Although it is true that this toxic lard is most difficult to shift and remove, a good exercise regimen combined with a healthy diet can help you get rid of excess fat and sport a flat belly without resorting to a whalebone corset. First Published Date: 27 Sep 2011 Last modified Date: April 18 2019 This page may have been updated recently as new information is available or the content may have been edited for better readability.